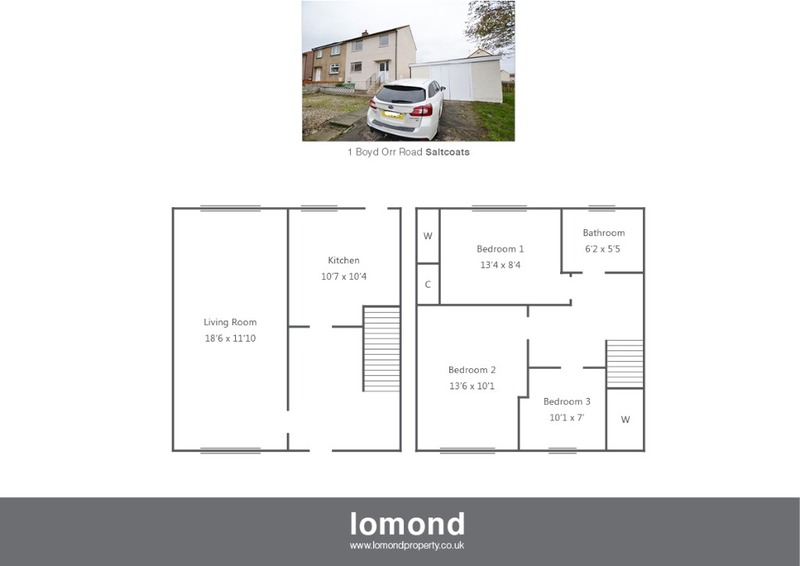 1 Boyd Orr Road is a semi detached villa situated in a popular residential area of Saltcoats. The property comprises three bedrooms, lounge/diner, kitchen and family bathroom. Further benefits include off street parking and garage. In summary the property layout extends to an entrance hallway with stairs to the upper level. The lounge/diner stretches the entire length of the property offering views of the rear garden. To the rear the kitchen is well stocked with floor and wall mounted units, large storage cupboard and access to the rear garden. The upper level houses three bedrooms, two of which are doubles and a family bathroom. Externally the property is located on a large corner plot, with gardens to the front, side and rear. There is off street parking to front with garage. Boyd Orr Road is a residential area. Saltcoats town is close by and provides access to a range of amenities including supermarkets, bars, restaurants and town centre shopping. There are a number of local primary and secondary schools within the greater 3 towns area.